The whole point of doing these set completion posts is basically to pat myself on the back :). Well I’m happy to do so with this “master set”. This is me patting the 2011 version of myself on the back. Or maybe it’s the 2011 me patting the current me on the back. Regardless, I’m glad to say I finished this up – it took a long time to finish everything I wanted from 2011 & 2012 Goodwin Champions. I finally did late last year. That’s over 4 years, though the main hold up was the Goodwin Travelers postcards that came as box toppers. Check out this link to see the rest of the base set post. This was the last of 2 World Traveler cards I got. It would have to be one of those cards or the Rube Foster. This is one of those few sets that carries over multiple years. I’ve been trying to finish this set for longer than anything else on my wantlists. And I was waiting on the last 2 cards for over a year. Finishing this set also finished both “master sets” for me from 2011 & 2012 Goodwin. So I’ve been holding off on those master set posts as well. They’re coming up next. 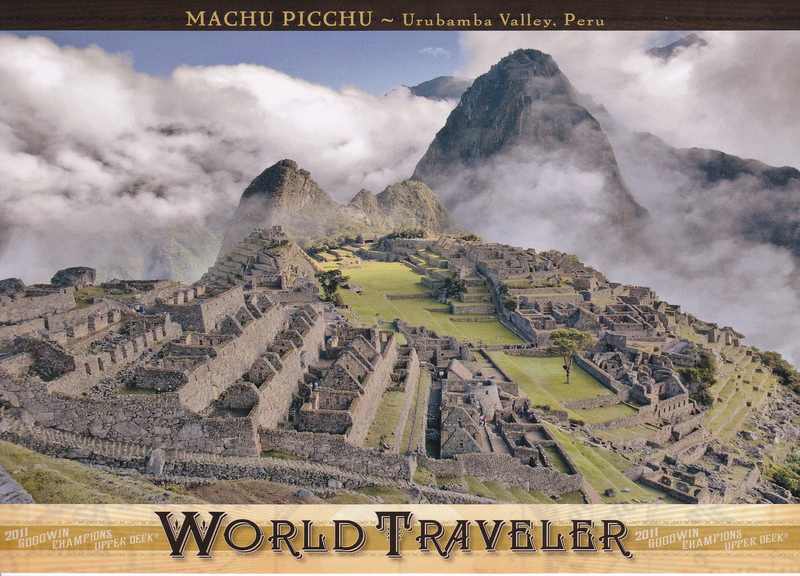 Set description: The World Traveler postcards came as box toppers in 2011 and 2012 Goodwin Champions. They are done in postcard fashion (5 x 7) featuring places to travel from all over the world. The 2011 cards feature specific sites throughout the world, while the 2012 cards showcase notable cities. Hall of Famers: None as it’s not a sports set. I got this from Beckett Marketplace last December. so-so on this set. I like the concept – but the black and white photos aren’t that great, and there are some things I’d have rather seen them do. They had a #/10 Presidential Masterpieces set that are hand painted. I kind of wish they had done a more common insert of that set with a non-painted version. I could have picked the card for the Na Pali Coast above – I’ve been to Kaua’i and seen it from a helicopter; the picture does it justice. To scan something different, I’ve always been intrigued by Machu Picchu – and this is a really cool photo of the Peruvian city in the sky. Any other tidbits: I would love to scan every one of these cards, but that would take forever. Instead, I’ll list the places I’ve been out of the 49 locations (card #1 is the planet Earth). I’ve been to 11. ET2 – Muir Woods Redwoods: I went to the California Redwoods when I was a kid. My Uncle’s family lives in Portland, and we traveled down there on a family visit out there. ET3 – Niagara Falls: I went there in 2009, on the way to Cooperstown for the induction weekend that year. 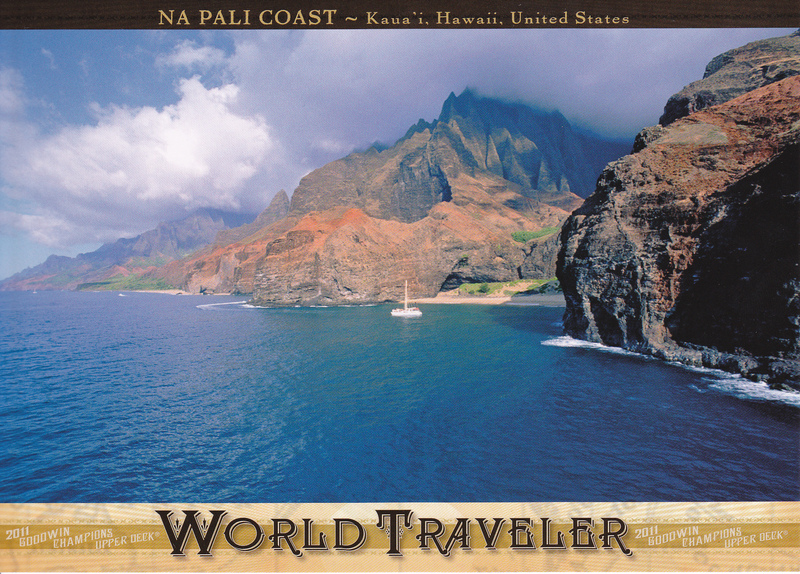 ET21 – Na Pali Coast: We went to Kaua’i for our honeymoon in 2008. WT4 – Los Angeles, USA: I’ve been there twice for work, though I didn’t stay too long either time, and I couldn’t do much while there. Chavez Ravine is one of the few ballparks I haven’t been to. WT7 – New York, USA: I’ve been there more times than I could possibly count (I lived in New Jersey for 2+ years). WT8 – Zürich, Switzerland: In 2001 I went on a trip to Europe through school. We took classes during the week in all different cities. One of them was Zürich, though the midterm was in Zürich and it was the one city where we really didn’t do too much. WT11 – Barcelona, Spain: On the same trip, we ended the classroom portion in Barcelona. The final was there, but I did enjoy the nightlife after we were done. WT14 – Washington DC, USA: I’ve also been to our nation’s capital about a half-dozen times. Most recently I was there in 2013 for a wedding. WT21 – Chicago, USA: I live in Chicago. WT22 – London, England: That was the first stop on our trip back in 2001; I actually met my wife there. I’d also been there once before with my parents. WT24 – Amsterdam, Netherlands: We stopped there during the weekend in between London and Paris in 2001. I’m surprised Paris wasn’t on the list. Doing this Elusive Eight thing was extremely helpful. I started this at the end of December, where I list 8 cards that have been really tough to track down. Since then, I’ve found 2 of those cards. 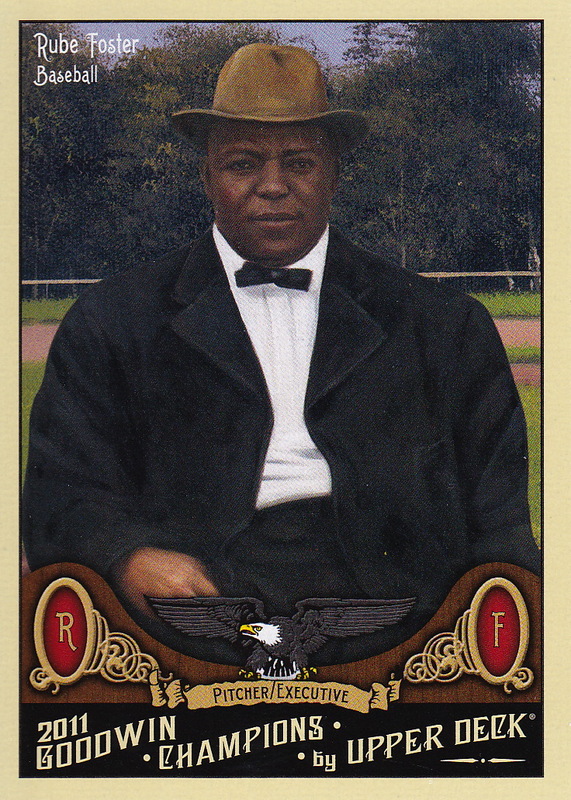 I found the Jackie Robinson 2011 Heritage card that finished off the master set there. And I just made a trade for one of the 2 Spectralite promos I needed from 1995 Topps. Alex Fernandez is shown above. I made the trade with Dan, who posted about the card on the Trading Card Database. I don’t use that TCDB Adam from Addiction is Therapy tipped me off about Dan’s post. Dan was great, he sent the card before I was going to be able to send my end of the bargain over. I sent him a 1968 Topps card I had and a few cards from 2016 Topps once I’d opened my box. These spectralite versions of the promo cards are really tough to find. 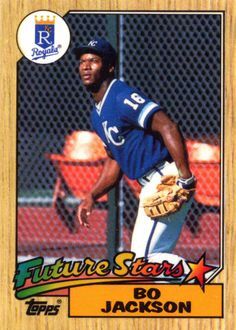 To repeat what they are, in 1995 Topps made a pre-production set of 9 cards. 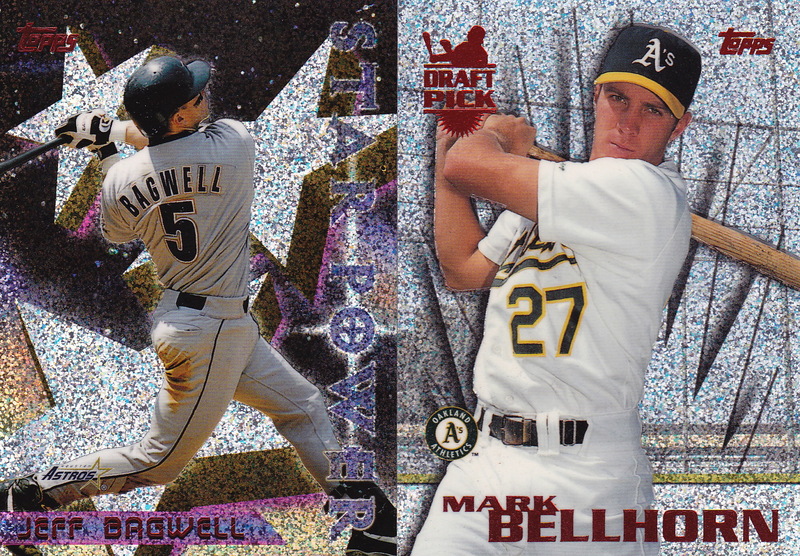 Those 9 cards came in packs of 10, with an extra “spectralite” version that previewed what the 1995 Topps Cyberstats parallels. This one was particularly frustrating, because Beckett has the wrong stock photo for the regular promo. They used the spectralite version. A lot of eBay sellers use the Beckett stock photo, and I can’t tell you how many times I’ve asked a seller about this particular card just to be sure they weren’t really offering the spectralite version. Eventually, I figured out what was going on and stopper bothering. Luckily, Dan came along and I’ve knocked another card off the list! Thanks again for the trade! Here’s the updated Elusive Eight, just in case anyone has these cards available! Remember – the pictures are the photos I have of other cards in the set. Since I don’t have them, I don’t have actual photos yet! I’m taking off 2 cards from 2012 Archives Combos set to make room for 3 cards from 1996 Topps that have proven to be very tough. 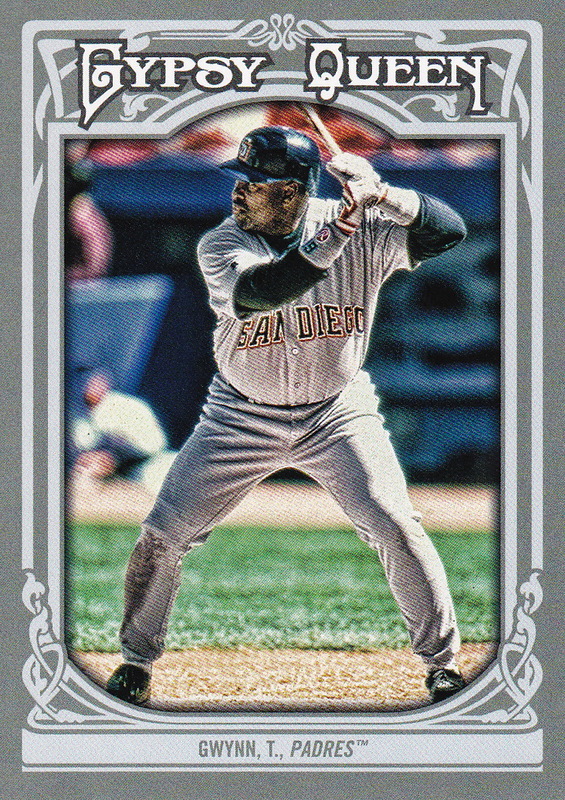 The Power boosters set paralleled the first 26 cards in the 1996 Topps set with some serious shine added. It’s actually reminiscent of the background effect Topps added for the 2011 Diamond Anniversary parallels, except these cards are also much thicker than the base cards. I could have considered them parallels and thus outside of my collecting goals, but they were kind of in the middle between parallels and inserts. So I decided to collect them. 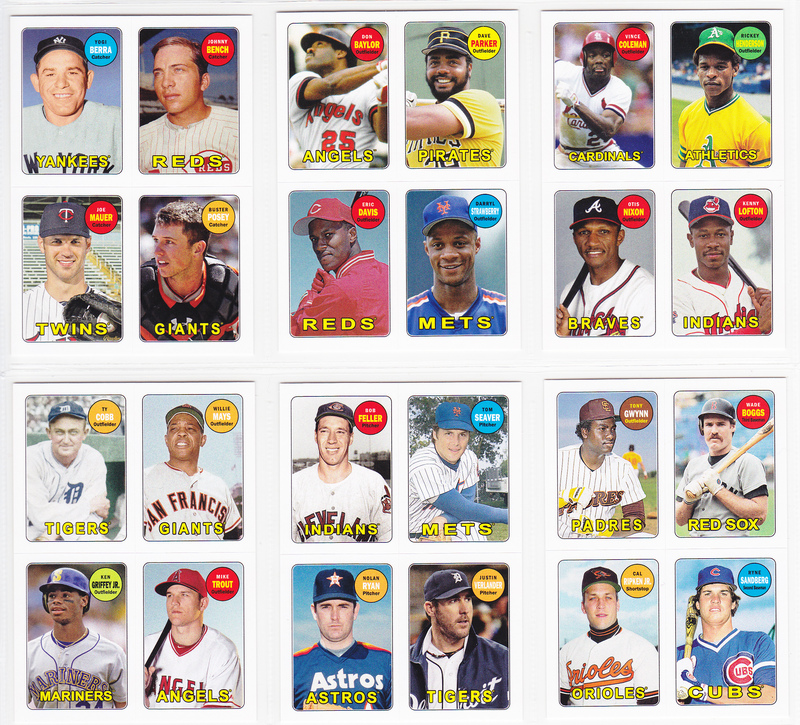 The first 12 cards, which focused on all-stars from that era, was relatively easy to complete. But the draft pick cards have proven very difficult to track down. Out of the 3 cards listed, only Tony McKnight ever made the Big Leagues. Here are some other cards that would be knocking on the door to make the list. 3 of them have been on the list at some point in the past, but were bumped to make room for the Power Boosters cards. This is the 3rd insert set from 2013 Topps Archives I’ve finished off – after the 1983 All-Stars set and the 4-in-1 sticker set (both of which were comparatively a much easier to complete). Set description: “Modeled after the 1965 Topps football design. 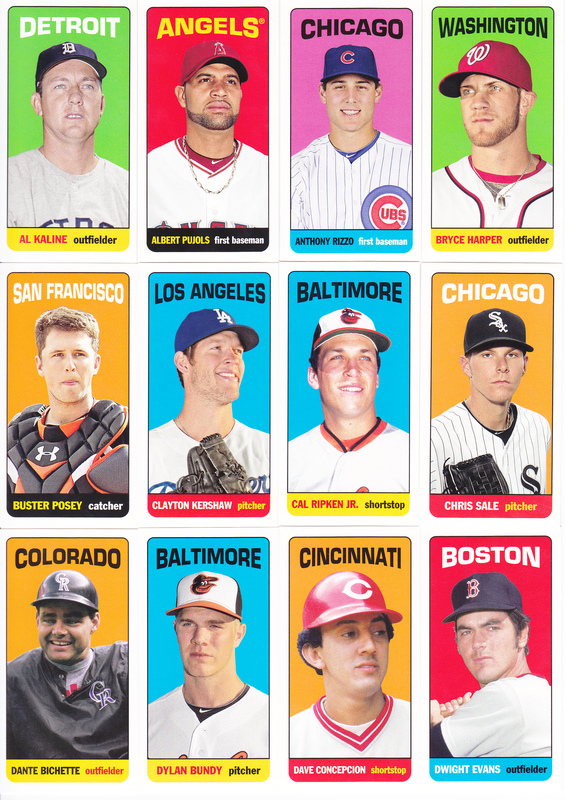 Featuring active and retired MLB players.” This was something of a new idea for Topps. They had done retro designs out the wazoo in the past, but doing it across different sports was a pretty new idea. The original cards are oversize (2-½ by 4-11/16) and had only AFL players. It’s famous for the rookie card of Broadway Joe Namath. The Archive version is the same design and shape, except Topps had to shrink them to fit them into packs. The 40-card set is as tall as a standard card but thinner. 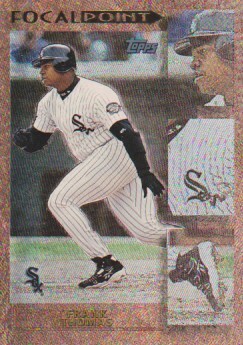 The card fronts have the player photo over a solid color background. The city name is at the top in block letters, with the player’s name and position in a block at the bottom. The backs are horizontal with statistics below a write-up on the left side. A cartoon with a factoid is on the right. I got this from COMC in September of last year. Thoughts on the set: Love it. The idea of crossing sports for Topps Archives is a really good one. I hope Topps does keeps doing that with this set. 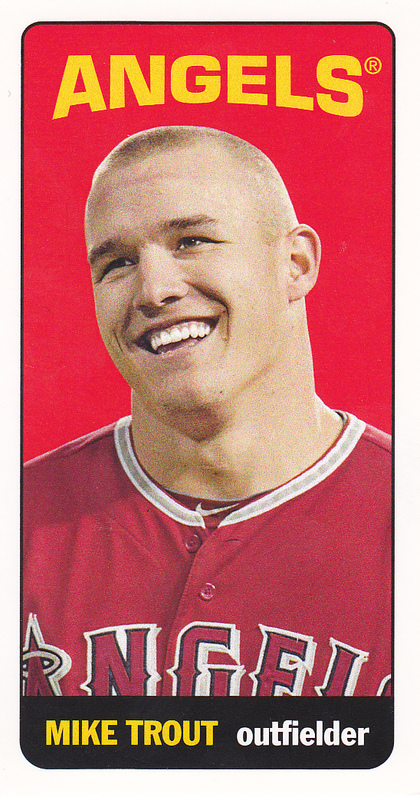 I particularly like this design, and Topps stays consistent across teams – all the Reds players have the same color scheme. That gets good marks in my book. I’d change 2 things. 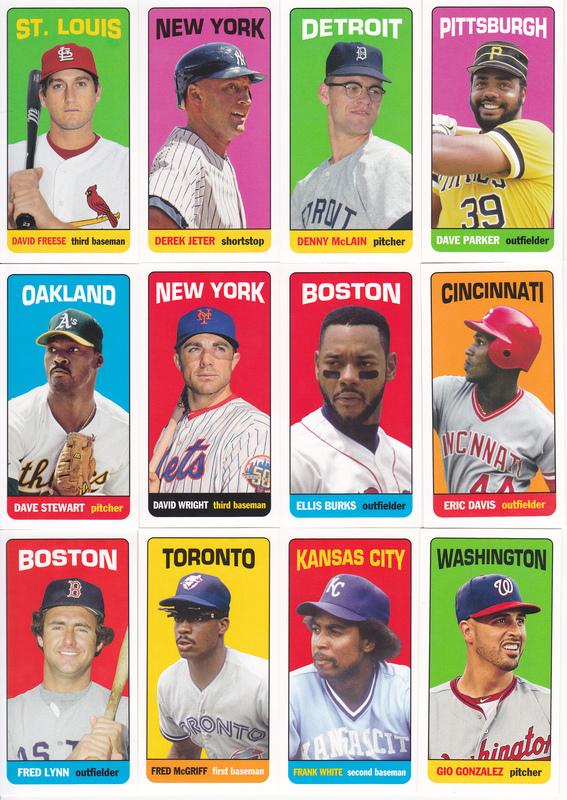 First, I’d only include guys who would have had 1965 cards, because I love the idea of “cards that never were”. Second, it’s lettered not numbered, which always ticks me off. I thought this set was only 36 cards (it’s actually 40) for nearly a year because I read that somewhere. 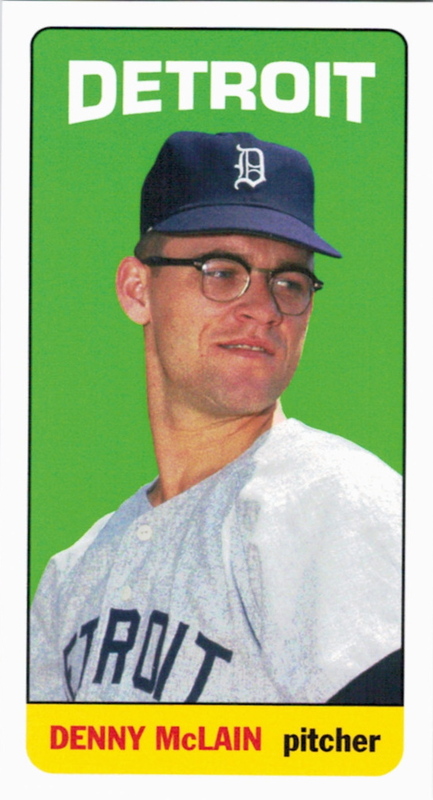 There are better historical players in the set, but you don’t see a ton of Denny McLain cards out there. Plus, the fact that he played in 1965 makes it cooler than the rest as well. It’s really tough to beat out the Eric Davis card at the very top. 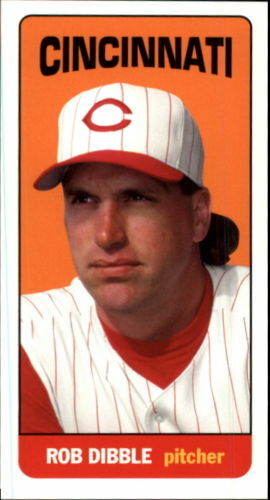 But, like McLain, you don’t see a lot of Rob Dibble cards out there. Awesome Topps included him. Any other tidbits: If you’ll notice the Trout card has the team name at the top, whereas other cards have the team’s city. 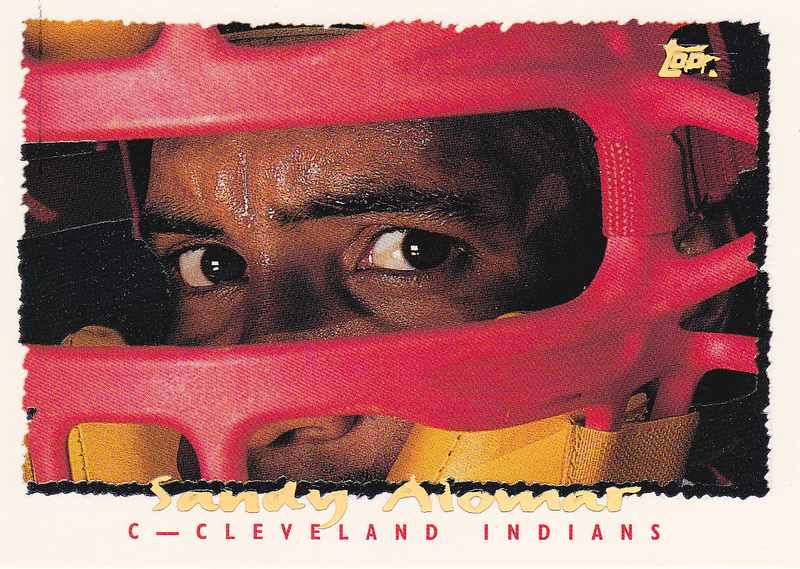 The Angels are the only franchise to get this treatment – Albert Pujols also has a card like this. This further highlights how ridiculous their city designation is; I guess Topps decided it didn’t want to fit “Los Angeles of Anaheim” at the top. Clayton Kershaw has a card and they do have “Los Angeles” for him. This was the third 2013 Topps Archives insert set I’ve completed. 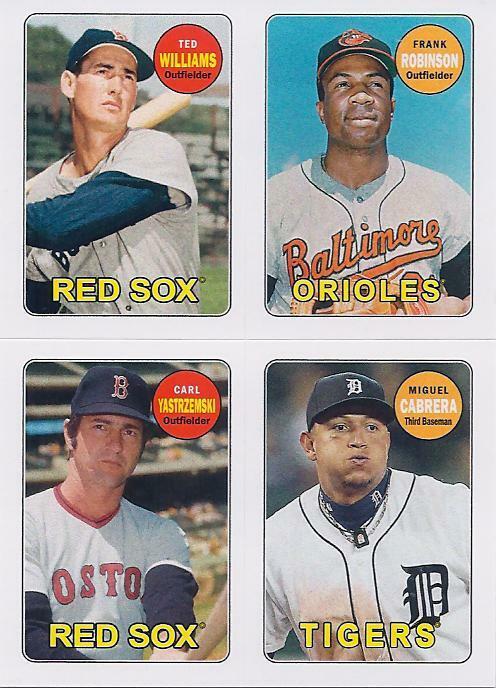 The 1969 4-in-1 Sticker insert set isn’t my favorite, but it is interesting in that it comes with some very cool 4-man combinations. Set description: “4 subjects per card, featuring active and retired players”. 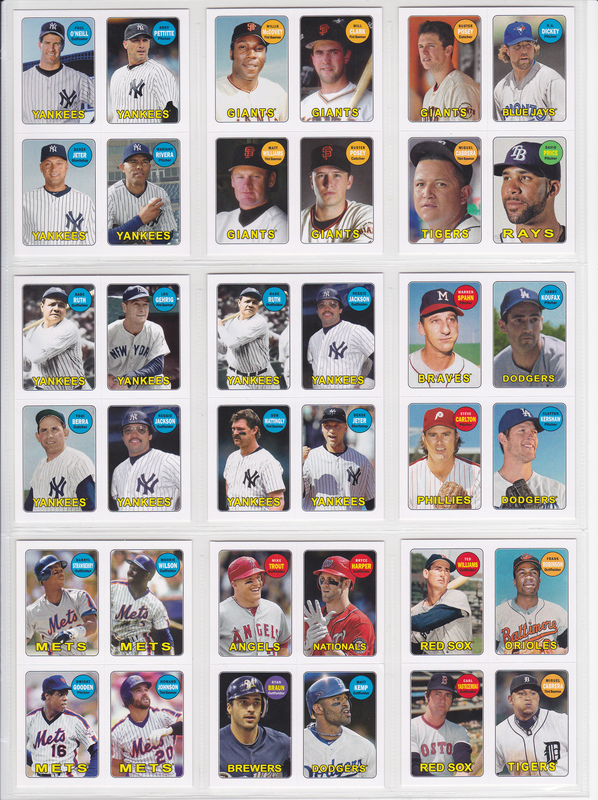 This insert set is designed like the 1969 4-in-1 sticker set, which was a test issue of 25 “cards” with 4 mini-stickers on each card. 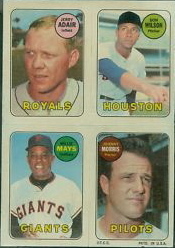 The stickers come in the form of the 1969 design, with the players coming from the 2nd series of Topps cards that year. These aren’t easy to find and command a pretty penny. The cards are blank-backed. Here’s my previous post comparing the current set with the old set. Willie Mays, Lou Brock and Al Kaline (via World Series subset cards), Bob Gibson, Leo Durocher, Don Sutton, Earl Weaver, Carl Yastrzemski and Pete Rose are all in the original 4-in-1 set. The Mays quadruple from the original is below. I picked the last card up from COMC last June. 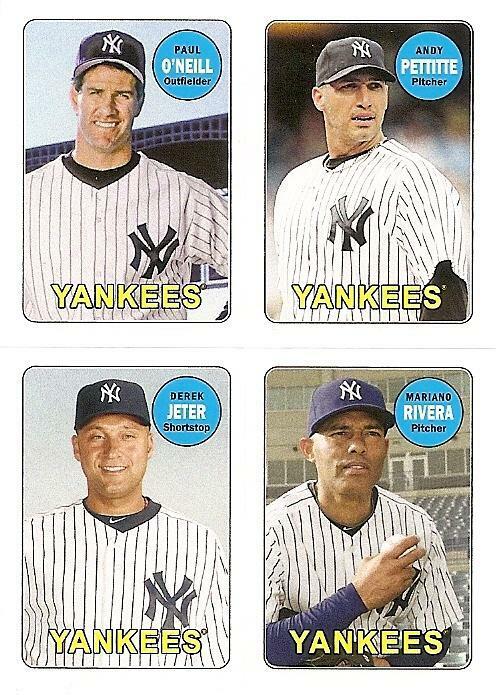 It’s cool to put O’Neill on there, but I’d have switched him for Jorge Posada to get the “CORE 4”. Thoughts on the set: Not my favorite design, but it has provenance in the original which I can appreciate. It’s funny how the scans turn out. You can’t tell where the first card starts and the second card begins. And the coolest thing is the combinations Topps chose. Like the card below. This was an easy winner. 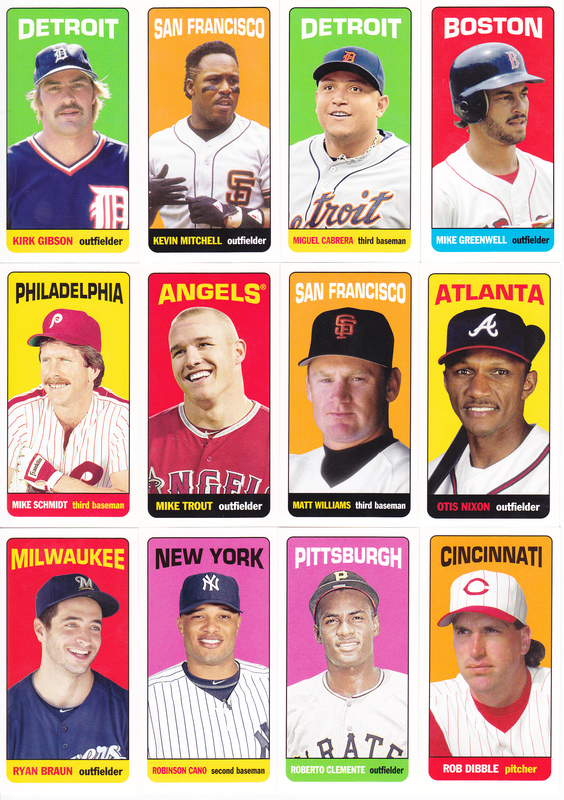 I really like the card with Cobb, Mays, Griffey and Trout at the top. It connects great center fielders of the past to today. 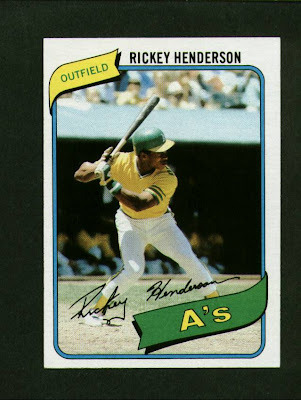 But this card has 4 of the last 5 triple crown winners (interestingly, Topps’ favorite son, Mickey Mantle, is the missing link in both of those groupings). Cabrera had just won the triple crown, and that was one of the greater achievements in sports of my lifetime. 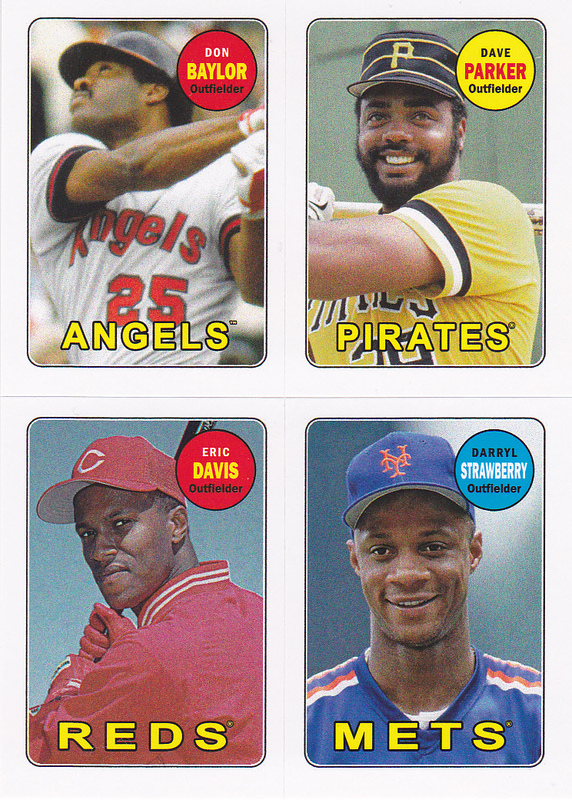 Johnny Bench has a card, but the card featuring Eric Davis and Darryl Strawberry is really cool. I get why Davis and Strawberry are on the card, but I don’t know what the overarching theme is to include Parker and Don Baylor. But it’s still a great card. Any other tidbits: I showed on the post linked above that Mays and Yaz had cards in both sets, but what I found interesting were how many guys are in the set twice. Buster Posey was the one player who is in the set 3 times. He’s on a great catcher card with Bench, Berra and Joe Mauer. 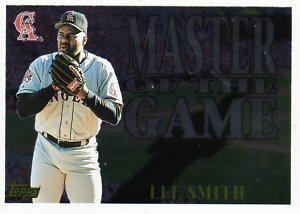 And he’s on a great San Francisco Giants card with McCovey, Matt Williams and Will Clark. Finally, he’s on a card with David Price, R.A. Dickey and Miguel Cabrera that has the defending MVP & Cy Young award winners from 2012. Most of the insert sets in Ginter are not of the standard size. You have the Baseball Highlight sketch cards and maybe 1 or 2 others, but the rest are minis. And there are cabinet cards or N43 cards that are box toppers. I finished off the Cabinet set from 2011 6 or 7 months ago. There’s a lot of duplicate wording on that write-up from the sell sheet. Basically, these are really large cards with scenes as the background and then 2, 3 or 4 photos of mini cards using the 2011 A&G design. Cards #1-6 are baseball highlights from 2010, while cards #7-10 are National Parks and the President and some other influential figure who helped to get the park that designation. The backs have a checklist of the specific portion of the set (the baseball cards only have the first 6 listed, the National Parks only have the last 4). They were a little off in calling the mini-pictured cards “parallels”. The players all had cards, however Tony LaRussa isn’t in the main set and most of the presidents or other figures aren’t either. Hall of Famers: 1. 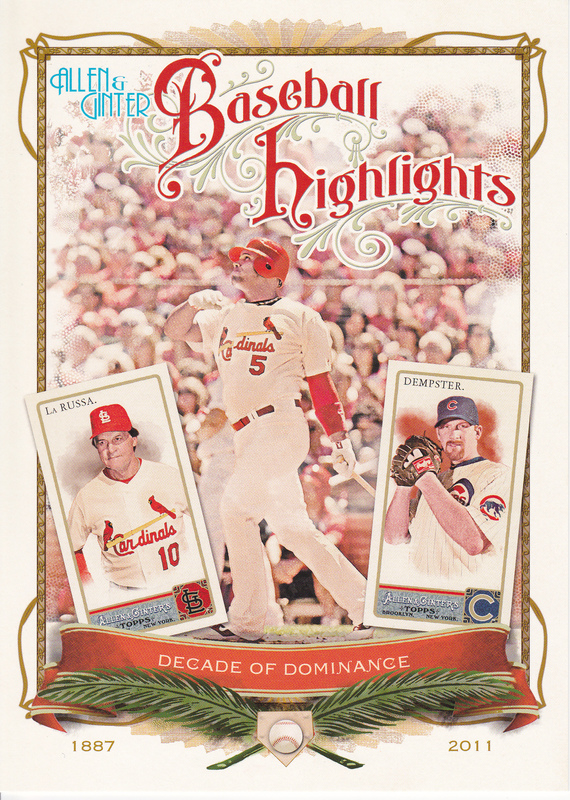 Shown above, Tony LaRussa is on card #6, which is titled “Decade of Dominance”. It’s honoring Albert Pujols, who did have quite an incredible first 10 years. 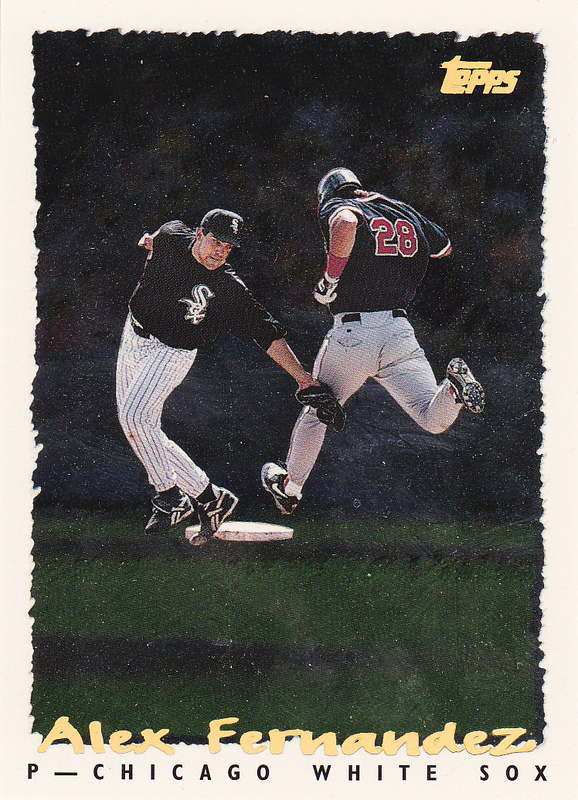 Ryan Dempster is the other player on this card. I was trying to figure out what this card was getting at, other than Pujols being really good. He hit more homers of Dempster than any other pitcher, but I think this card is in honor of May 30, 2010. In that game, Pujols went deep 3 times. Two of those bombs were off of Dempster, who also gave him 2 intentional passes. So he could have hit the magical mark of 4 homers in a game if not for the free passes. Card that completed my set: #CB-9 – Yosemite National Park. I got this card from COMC back in May. Pretty cool putting Old Faithful on there, though there is no “parallel” in the main set. 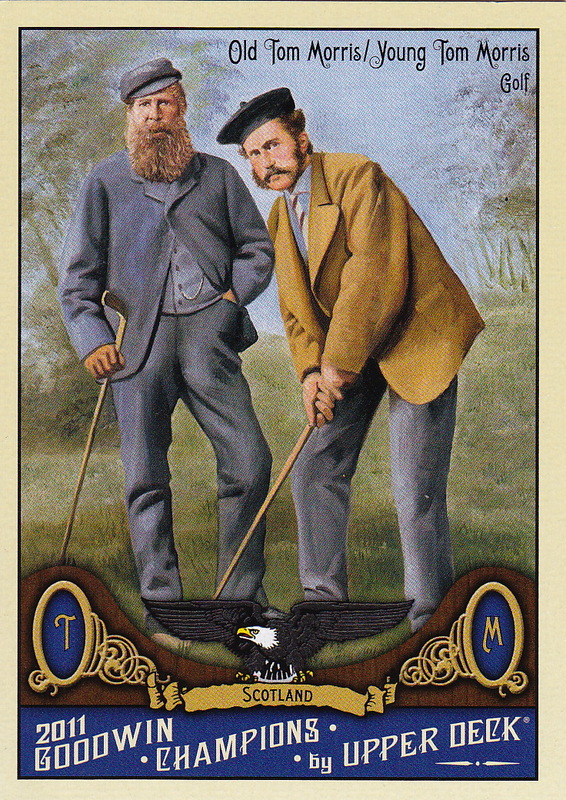 Old Faithful did have a card in 2009 Allen & Ginter. Thoughts on the set: Retro sets are best the more they connect with the original. Cabinet cards were a staple of tobacco cards from back in the late 1800’s, so that’s pretty cool. I like the combination of national parks and baseball highlights. This card is for the National Park in Northern California. I picked this one because it’s the only one I’ve been to out of the 4 cards in this set. 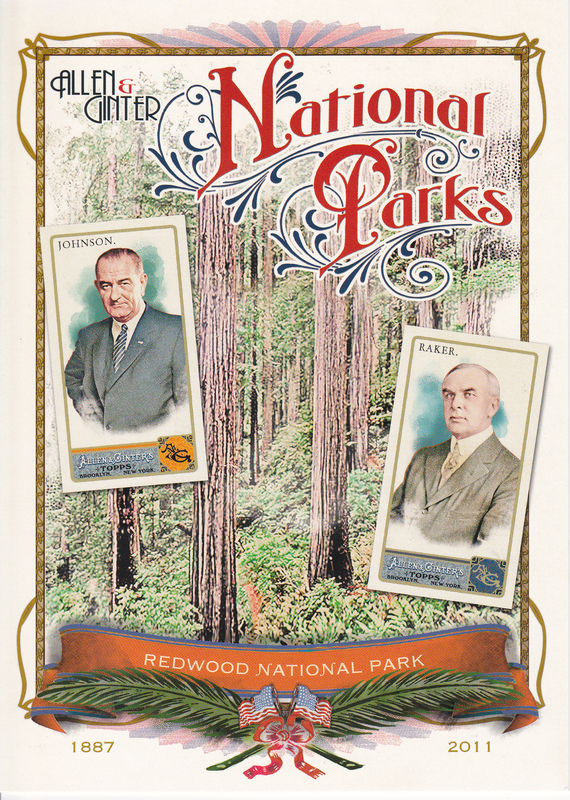 Other tidbits: Here is a checklist of the 10 cards in this set, followed by information on the date of the game (or year the National park gained its status) and the “mini cards” shown on the cabinet. CB-1 – “Galarraga’s almost perfect”. June 2, 2010. Armando Galarraga, Miguel Cabrera, Jason Donald. This would probably be my favorite if I had picked from the baseball portion of the set. This is from the perfect game that Galarraga lost when umpire Jim Joyce incorrectly called Jason Donald safe at first base for the 27th out. Topps should have figured a way to get Joyce onto this card. CB-2 – “Postseason No-No”. October 6, 2010. Carlos Ruiz, Ryan Howard. One thing that is really weird about this set – the main guy in the event is usually in the background, but not on the mini card. The only exception is It depicts Roy Halladay’s no-hitter against the Reds, which was the 2nd no-hitter in postseason history. You see Ruiz running out to Halladay in the background, but Halladay isn’t one of the mini cards. Howard had the last put out at first, so I get why he’s on there, but to me just having Ruiz and Halladay (or at least having the guy who threw the no-no) would have been the way to go. CB-3 – “Dallas is perfect in Oakland”. May 9, 2010. Landon Powell, Daric Barton. Topps did the exact same thing here with Dallas Braden’s perfect game. Powell was the catcher, Barton gloved the last out at first. CB-4 – “Multiple Milestone Matchup”. September 23, 2010. Felix Hernandez, Jose Bautista. Ichiro is in the background here. Hernandez pitched a complete game near the end of his Cy Young season. Bautista, however, went deep off him to give Toronto a 1-0 win. It was Bautista’s 50th homer of the season, and Ichiro notched his 200th hit in the game as well. That was his 10th straight season with 200+ hits, extending his own record and tying Pete Rose’s record for number of such seasons in total. CB-5 – “A-Rod does it again, for the 600th time”. August 4, 2010. Derek Jeter, Shaun Marcum. This one’s pretty simple. A-Rod hit his 600th homer. Shaun Marcum was the pitcher. Derek Jeter was on base. CB-7 – “Grand Canyon National Park”. 1919. President Woodrow Wilson, President Benjamin Harrison, President Theodore Roosevelt. This card has 3 Presidents on it. Wilson was the President who signed the bill to make the Grand Canyon a National Park. 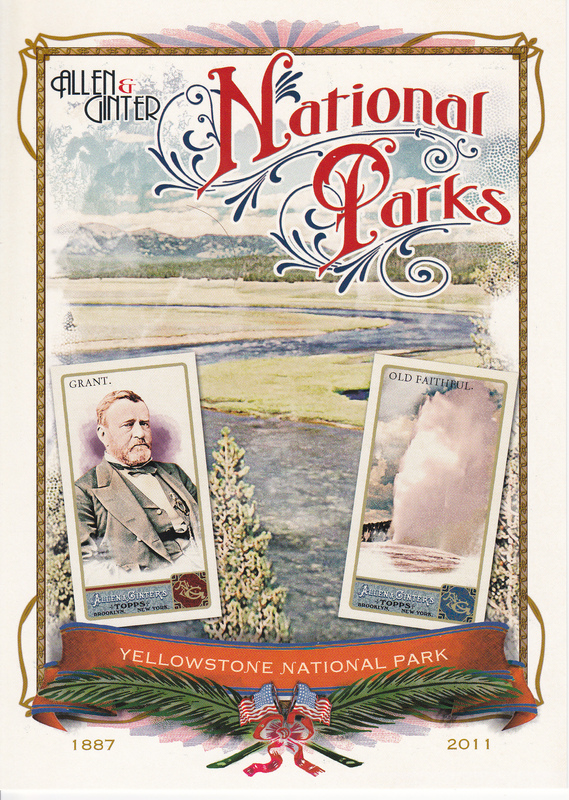 Benjamin Harrison actually first introduced a bill to make it a National Park in 1882 when he was a Senator. And Teddy Roosevelt established the Grand Canyon Game Preserve when he was President. CB-8 – “Yosemite National Park”. 1864. President Abraham Lincoln, Senator John Conness. Conness lobbied for protection of Yosemite, Lincoln signed it into law. CB-9 – Yellowstone National Park. 1872. President Ulysses S. Grant, Old Faithful. CB-10 – Redwood National Park. 1968. President Lyndon B. Johnson, Congressman John E. Raker. This is the 9th card I got in my crazy idea to collect all of the cards in the All-Star Stitches set from 2015 Topps Update. As a reminder, I went to the All-Star game and Home Run Derby in Cincinnati. These cards that have swatches from the Monday practice festivities. 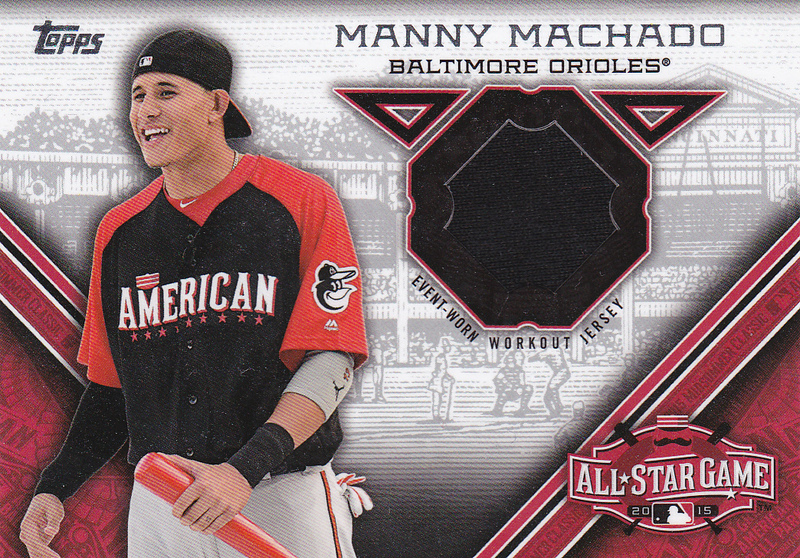 Machado is the 3rd participant in the Home Run Derby I’ve added to this collection (Anthony Rizzo, Albert Pujols). How I got the card: trade with Andrew of Tomahawk Chop. Thanks for the trade, Andrew! This was his 2nd All-Star selection. Home Run Derby: Machado was the 5-seed in the derby for the 18 homers he had as of July 7th. He lost to Joc Pederson, 13-12, in the first round. All-Star game: 0-1. Machado pinch hit for starter Josh Donaldson in the top of the 5th, hitting a deep fly off of Clayton Kershaw that was caught in left field. He doubled off of Francisco Rodriguez in his second at bat, scoring Brock Holt to extend the AL’s lead to 4-2. He came around to score on a Prince Fielder single. Mike Moustakas pinch hit for him in the top of the 9th.